Targetprocess makes it possible to track billable and non-billable entities and time records. This article describes how to set up the tool to distinguish billable and non-billable time spent records (Time entities) when Time Tracking is used. In order to set up the solution, we will add a checkbox or drop down list custom field to the Time entity. It helps to distinguish billable and non-billable time records. Then build reports to produce detailed breakdowns (per work items, work scopes, users, roles, and date ranges). The custom calculations are performed via Visual Reports calculations. Results are displayed in reports only. Calculations can be configured and modified by any Targetprocess user (report owner). Export the reports to tabular and graphical files for external audit and further processing by third-party software. Improperly configured calculations and reports may be not accurate enough. Verify the reports before using them for billing and invoicing purposes. Use non-verified reports on your own risk. To get calculated totals displayed in detailed views, enable filtering and grouping in Targetprocess views and legacy tabular reports, add custom calculations for work items and high-level planning entities. add custom calculations for work items and high-level planning entities. The custom calculations are done by Custom Formula Metrics. They can be configured and modified by Administrators only. See detailed guide: Metrics for Billable and Non-Billable Time Spent Totals. Changes described below are performed by Administrators. 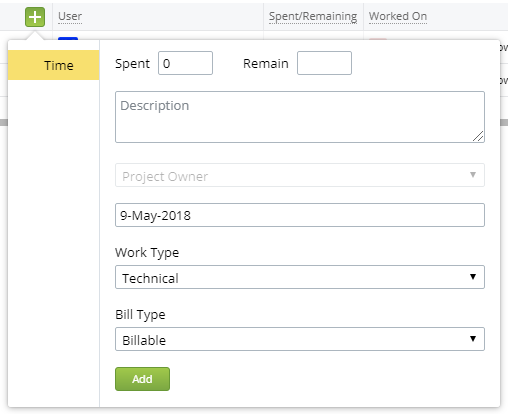 To be able to distinguish billable vs non-billable Time records, add a checkbox or dropdown custom field to Time entities. Once the field is added it appears in all Add Time Forms. Check Box custom field has just 2 options: checked and non-checked. 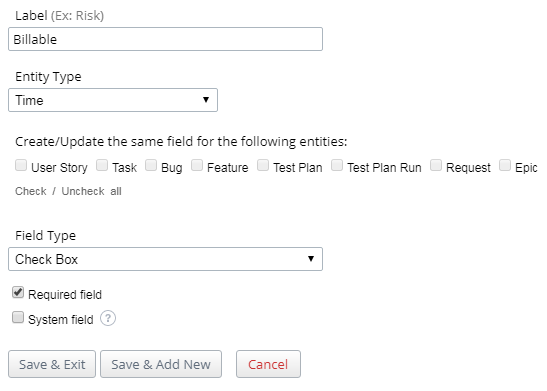 Non-checked is always a pre-selected option for Check Box custom fields on Add forms. It is not possible to change this behavior. Drop Down List custom field supports more than 2 options. Say you may introduce multiple billable and non-billable codes. Default (pre-selected) option can be specified. 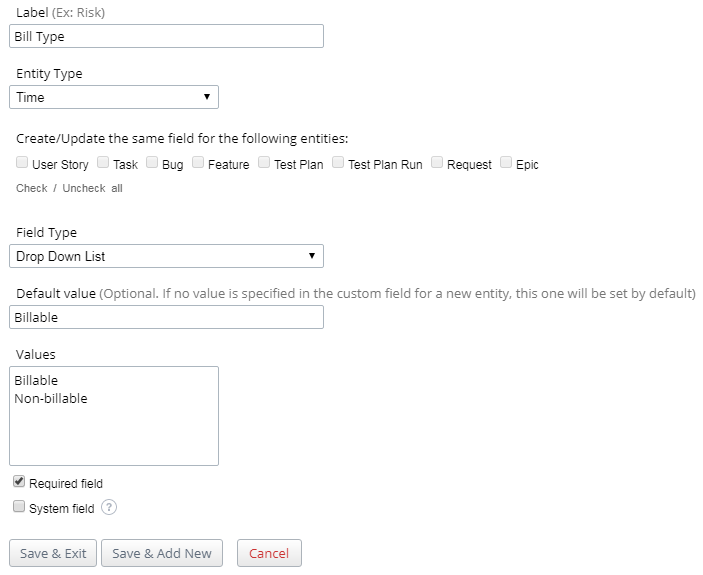 Modify custom fields settings in the particular Process your Project follows. Here is how the addition form for the new field should be filled in. Check Box custom field: we'll use Billable label here and in further examples. Drop Down List custom field: we'll use Bill Type label here and in further examples. Required field setting does not affect custom fields of Check Box type and custom fields of Drop Down List type with Default value set for Time entities. With any setting (checked / non-checked) the field is always displayed on all Add Time Forms. However for consistency and future compatibility we recommend to add the fields as Required. 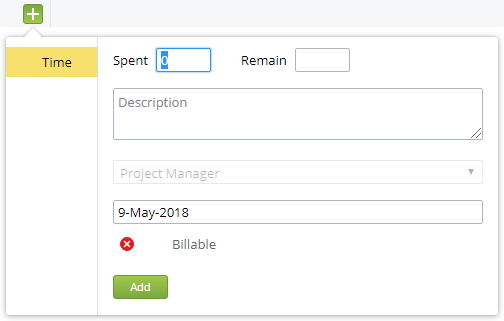 Once the field is added the selector for Billable option appears on Add Time Forms. Times tab displays time spent records per work item in its detailed view. Times tab for a user story includes records submitted to its nested tasks. Time List view is recommended one to see detailed list of time records submitted to multiple work items. On this view each time record is represented as a row. The view supports various filters: most common ones are by date range, by project, by person, by work items. Grouping is supported as well. Data from this view can be exported externally. More on capabilities of the view: Time List. Time records on these views are editable. During review, it is possible to correct records and switch them one by one from billable to non-billable or vice versa. Create the Time List view manually if you don't have it set up yet. 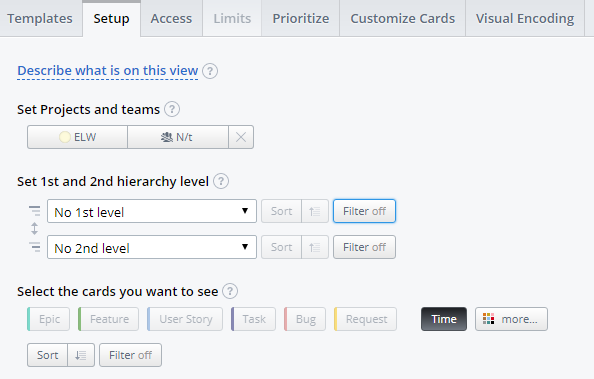 Click + Create > List menu item to start building a view. 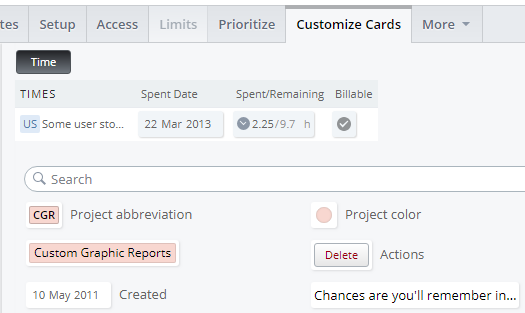 On Customize Cards tab, add Billable column to list row layout. Detailed time reports are based on Times data source. More on detailed time reports: Detailed Time Reports. Put one of the supported Data Fields to X and/or Color axes to get Time records grouped per corresponding field. Totals are calculated per each group. The visual report below compares billable vs non-billable time spent summarized per person.